or free up tied capital by selling unused assets. 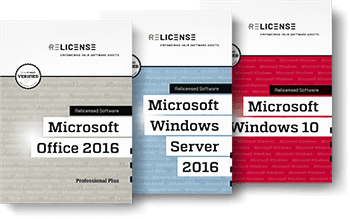 Relicense is a leading European supplier of legally compliant Microsoft volume licenses. Our name is our calling. We have been relicensing software by legally compliant transfers between organizations since 2008. We offer favourably priced licenses in line with real requirements. By purchasing unused licenses, we help free capital to be used for other investment purposes. Don't let this opportunity pass you by. Draw on the benefits second hand software has to offer! Second hand software supplied by Relicense can help you realize intelligent, highly cost-effective licensing scenarios in full legal compliance. This allows for total overall cost savings of 70 % not as an exception but rather as the general rule. Out-of-use or never used software licenses amount to dead capital that, however, can be activated rapidly and easily by selling to Relicense. A transaction process that is transparent for all concerned – and that, of course, directly involves the software manufacturer as well – acts as a safeguard for 100 percent legal compliance. We offer expert advice in all product, licensing, and legal matters. We strictly observe all legal and manufacturer's requirements. We frequently undergo audits conducted by independent auditing organizations. We notify the manufacturer about each individual license transfer. Since our inception, we have been re-licensing without a single complaint filed by any manufacturer. By submitting this form, I agree that my details entered therein may be stored and used for the purpose of receiving this Newsletter. I have read the data privacy statement. Please note: This newsletter is distributed by our service provider, MailChimp. Your Information will not be passed on to any third party. This consent can be withdrawn with future effect at any time by sending an email to .